Mince jalapeno and toast them in a small fry pan over medium heat. Chop garlic, red onion, green onion and cilantro finely. Can use a food processor for the garlic and onion. Add to a medium sized bowl. Cut avocado in half, remove seed, scoop out flesh and add to bowl. You can chop the avocado before adding if you prefer. I usually just mash it all together at the end. *Reserve one avocado seed for later. Start mixing and mashing using a fork. If the avocado isn't mashing well, I run my knife through it as I mix with the fork. Add salt and pepper (about a 1/2 teaspoon). I start by adding a little and gradually add more as I taste it. Gently stir in diced tomato at the end. If serving at a party I just sprinkle the tomato on top for the pretty contrast in color. Let the flavors congeal for about 15- 20 min before serving. *When storing guacamole, put an avocado seed in the middle of the guac to keep it from oxidizing. Cover with plastic wrap and push the plastic onto the guac so that go air is touching it. You dip will stay fresh for about 4 days. I love avocados! Give me a plain avocado mashed with lemon juice, salt and pepper, and I am a happy man. That said, I like my guacamole spicy with garlic and jalapeno. This recipe is as good as it gets! I subbed lemon for lime and it tastes just as good. 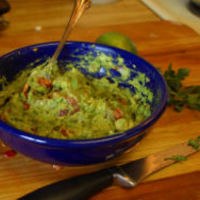 When I want guacamole, I keep coming back to this recipe. My minor changes: double the jalapeno (the avocado oil suppresses the heat of the pepper), double the lime, and do not mix in the tomatoes. I slice the tomatoes and spread on top just before serving. Thank you Lyndsey for sharing it. Looks really great, thanks for sharing! I like your recipes, Lindsey, please share more, can't wait to taste it!